Farrar Filter Company Inc. was established in 1949 in Paterson, New Jersey. The company has been in continual operation ever since, operating as both an air filter sales and service company and an activated carbon service organization. Farrar maintains a fleet of 16 service vehicles that are utilized in servicing over 2500 customer accounts. 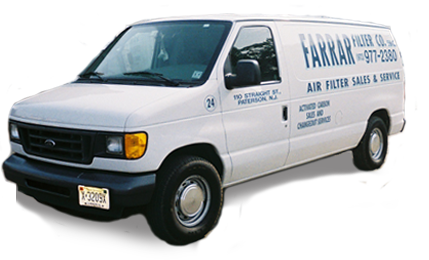 Farrar Filter Company also services odor control systems within the East Coast area. This is done through the exchange of carbon panels and modules on-site by our service technicians and the use of two vacuum trucks from our fleet for vacuum applications at fragrance and sewage treatment plants and environmental clean-up sites. Farrar Filter Company also maintains a 20,000 square foot warehouse, stocking all types and sizes of filters, to include disposable fiberglass and synthetic panels, pleated filters, pads, internal ring panels, HEPA filters, frames, carbon filters and housings. We also have an in-house testing laboratory for detecting the activity rating of carbon samples we receive from our customers. Through this procedure, we can determine the life cycle of the activated carbon in service. Please feel free to contact us with any questions or inquiries you might have concerning our capabilities and our services. Farrar is proud to be the leading air filter and carbon supply and service company in the northeast.